The Archaeological Ensemble of Mérida holds the remains of many public buildings that were the trademarks of a major Roman provincial capital. Mérida was founded in 25 BC with the name of Emerita Augusta. The city became the capital of Lusitania province, and one of the most important cities in the Roman empire. Some later monuments (like the Moorish Alcazabar and two early Christian churches) are also part of the as world heritage site designated area. 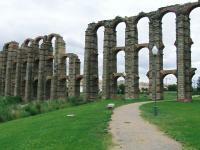 Already at Mérida's admission in 1993 there were 20 other (Mediterranean) Roman heritages inscribed on the List. And many more followed, currently I count 28 of them and even last year one was added (Serbia's Gamzigrad-Romuliana). "Ancient Rome" is one of the most common site categories. One just wonders how many is enough? 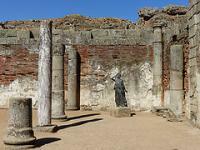 My personal favourites so far have been Rome, Pompeii and the Villa Romana del Casale. Before my trip to Extremadura I wondered what Mérida has to offer that all the others don't. Modern Mérida feels a bit dilapidated at first sight: graffiti, poor housing. I started my tour of the Roman monuments at the amphitheatre and the theatre. For 10 Euros you get an entry ticket to these and the other important sites in town, which can be used over several days. Good value I think. The prize piece is the ancient Roman theatre, which could seat 6000 people and still has the formidable stage with marble columns and statues (although these are replicas). Close to the theatres is the Roman Museum, which is very much worth visiting. This is were my initial concern faded away. The accomplishments of the Ancient Romans continue to amaze. Remember that the Civilization of Ancient Rome existed really early in history - more than 1000 years before Angkor Wat or Machu Picchu were constructed - and that so much is left, both physical and in writing. There's a well presented exhibition here about the local Roman road system, the Via de la Plata. Entry to this great museum is only 2.40 Euros (and free to minors, seniors and the unemployed!). 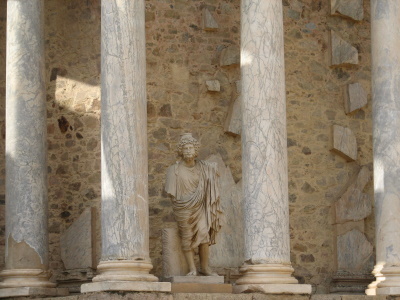 The numerous Roman monuments of Mérida are scattered around the modern town. Their quality lies in their ensemble: it would be a great destination for a school trip as you can point out every aspect of life in a Roman city. It shows how they lived (how the rich lived anyway), what they did in their spare time (the theatres, the circus), how they travelled and how they buried their dead. So, Yes, Mérida surely deserves its place among the 28 Ancient Roman WHS. Mérida was, in Roman times, the capital of the large province of Lusitania, which stretched across parts of southern Spain and most of Portugal. It was one of the most important Roman cities on the Iberian peninsula and today is one of 2 Roman-themed WH sites in Spain. The other is Tarragona on the Catalonian coast, also a former provincial capital. Mérida does have a star attraction - the very well-preserved Roman Theatre and Amphitheatre -, something that Tarragona doesn't really provide, but Tarragona probably has a higher number of different Roman sites and buildings than Mérida has, so if you are interested in ancient history, it may be worth checking out both places. There are a handful of reasonably impressive Roman-era buildings sprinkled throughout Mérida, such as the Arch of Trajan, the Temple of Diana, and the Roman Bridge (which can still be used today, similar to the one in Salamanca), and there are some nicely preserved remnants of aqueducts which housed many storks' nests when I visited in October. And right next to the Amphitheatre, there is an excellent Roman Museum with a fantastic collection of mosaics. So even if Mérida is certainly a bit off the beaten track, it is definitely worth a visit for anyone with an interest in Roman history. I visited this WHS in August 2014. Merida was my first stopover point after a long road trip in Portugal. It was very hot and dry so the free entrance (being a national holiday) to the National Museum of Roman Art was a godsend. It houses several Roman remains and above all beautiful mosaic floors. Next I visited the Temple of Diana, the Arch of Trajan, the crypt beneath the floor of the church of Santa Eulailia, the thermal baths and a couple of Roman residences and tombs. The combined ticket now costs 12 euros but it's quite worth it for what you get to see. The main highlights are the Roman Amphitheatre and Theatre but before leaving town I also visited the Roman Circus, the Guadiana bridge and the aqueduct. On the whole I must say that I prefer Tarragona due to the amphitheatre's proximity to the Mediterranean Sea and the superb aqueduct there. Merida's star attraction to me was the National Museum of Roman Art. There were a lot of sites to visit within a small area in Merida. The outstanding features for me were the pristine mosaic floors of ancient houses near the amphitheatre and the necropolis in the crypt beneath the floor of the church of Santa Eulailia, which contained more mosaics. Besides containing interesting exhibits, the Museo Iberico also provided a selection of tasty meals in its restaurant at lunchtime. I visited Merida in 2003 and thoroughly enjoyed it. Make sure you arrive early to the ruins as it can get very hot and crowded. The museum must not be missed. It is a work of art in itself with many exhibits. I would love to go there again.